A teenager has been charged after a mystery hazard caused gridlock on the M3. The 17-year-old boy from Winchester is accused of two counts of arson and two counts of causing danger to road users. The busy motorway was closed for 11 hours last week after a mysterious material was discovered on the carriageway. Bomb disposal experts were called in to investigate the hazard alert, leaving thousands of motorists and passengers stranded. The main route between London and Southampton was closed between junctions 9 and 11 while the "potentially hazardous material in the road" was dealt with. The substance, which was thrown from a motorway bridge near Winchester, was later discovered to be flammable, not explosive. 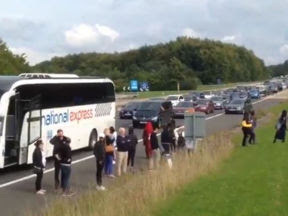 Frustrated travellers described the scene as "chaos", with some even driving the wrong way down the hard shoulder to escape from the gridlock.